Heart failure is a life limiting cardiovascular condition, frequently encountered in the increasingly aged population. People affected endure a symptomatic burden and mortality risk at least equivalent to those associated with common cancers. However, the clinical scenario is usually more complicated in that heart failure tends to occur in multimorbid older individuals who exhibit an unpredictable disease trajectory. In most patients, cardiac function tends to decline inexorably, with a mortality of about 50% in the 5 years following diagnosis. An ever more complex evidence-based therapy, which likely materially benefits less than half of those with this clinical diagnosis, involves polypharmacy, implanted cardiac devices, and consideration for surgical intervention including cardiac transplantation. Acknowledging its prognostic ambiguity, the capricious nature of the heart failure state, and the relatively onerous treatment protocol may undermine care coordination, patient autonomy, and ultimately conflict with patients’ and families’ preferences for care along a progressively declining clinical course to the end of life. 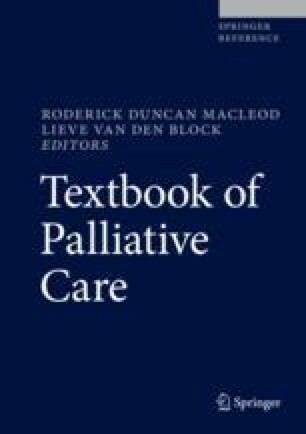 This chapter describes the challenges and opportunities in providing palliative care to this burgeoning clinical population. Centers for Medicare & Medicaid Services, Dept of Health and Human Services. MLN matters: ventricular assist devices for bridge-to-transplant and destination therapy. https://www.cms.gov/Outreach-and-Education/Medicare-Learning-Network-MLN/MLNMattersArticles/Downloads/MM8803.pdf. Published 29 Aug 2014. Accessed 10 Oct 2017. Hindricks G, Camm J, Merkely B, Raatikainen P, Amar DO. The EHRA White Book, 10th ed. European Heart Rhythm Association. 2017. https://www.escardio.org/static_file/Escardio/Subspecialty/EHRA/Publications/Documents/2017/ehra-white-book-2017.pdf. Accessed 2 Nov 2017. Janssen DJA, Johnson MJ, Spruit MA. Palliative care needs assessment in chronic heart failure. Curr Opin Support Palliat Care. 2018;12(1):25–31. https://doi.org/10.1097/SPC.0000000000000317. National Heart Foundation of Australia and the Cardiac Society of Australia and New Zealand (Chronic Heart Failure Guidelines Expert Writing Panel). Guidelines for the prevention, detection and management of chronic heart failure in Australia. Updated October 2011. Document PRO-119.v2. https://www.heartfoundation.org.au/.../Chronic_Heart_Failure_Guidelines_2011.pdf. Accessed 12 Nov 2017. Rustad JK, Stern TA, Hebert KA, Musselman DL. Diagnosis and treatment of depression in patients with congestive heart failure: a review of the literature. Prim Care Companion CNS Disord. 2013;15(4). https://doi.org/10.4088/PCC.13r01511. University of Colorado. (2016) Patient Decision Aids – Implantable Cardioverter-Defibrillator (ICD). URL: http://www.patientdecisionaid.org Accessed 5 Nov 2017. Yim CK, Barrón Y, Moore S, Murtaugh C, Lala A, Aldridge M, et al. Hospice enrolment in patients with advanced heart failure decreases acute medical service utilization. Circ Heart Fail. 2017;10(3). https://doi.org/10.1161/CIRCHEARTFAILURE.116.003335. Yu DS, Li PW, Chong SO. Symptom cluster among patients with advanced heart failure: a review of its manifestations and impacts on health outcomes. Curr Opin Support Palliat Care. 2017. https://doi.org/10.1097/SPC.0000000000000316.